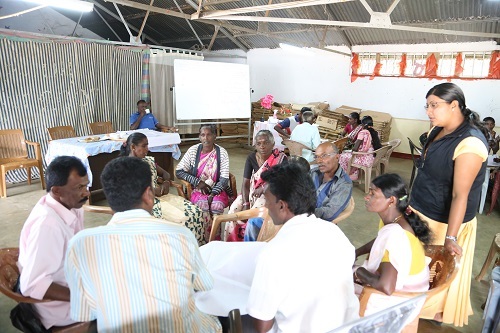 Human Development Initiative through Empowerment and Settlement Improvement in the Plantation Settlements in Sri Lanka. The MPCC is nearing completion at Liddesdale estate. UN-Habitat, with funding from the Korea International Cooperation Agency (KOICA) is implementing the project “Human Development Initiative through Empowerment and Settlement Improvement in the Plantation Settlements in Sri Lanka (HDI)” in Nuwara Eliya district. The project aims to empower and build resilient plantation communities with satisfactory living conditions, safer settlements, better access to basic services and improved livelihood skills. One of the key objectives of the HDI project is to improve community infrastructure facilities in remote villages based on priorities identified by the communities. The project is currently implementing 14 infrastructure initiatives identified at Community Action Planning (CAP) Workshops held in the project locations. 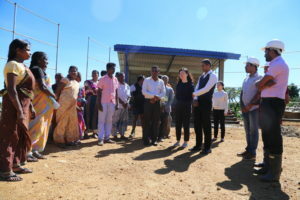 In one of the selected locations – Liddesdale estate, a Multi-Purpose Community Centre (MPCC) and a playground are being constructed with funding from the project. Liddesdale tea estate, established in 1880, is located in the Walapane Divisional Secretariat (DS) division in Nuwara Eliya District. The estate is managed by the Mathurata Regional Plantation Company. The estate, covering a total land area of 462 hectares, consists of four divisions – Liddesdale A, Liddesdale B, Diyanilla and Harasbedda. The estate has a labour force of 1,168 with a resident population of 4,065 people. CAP workshop in progress with community members. When UN-Habitat commenced project activities in the area, a CAP workshop was held to consult community members and identify key issues and priority infrastructure needs. The lack of a dedicated indoor community centre was identified as a major challenge by community members during this discussion. Due to the lack of a community centre in the village, the residents used alternate spaces such as neighbouring schools and the temple cultural hall for their events. However, these buildings lacked basic facilities such as toilets, adequate furniture and office space, making such gatherings difficult. In addition, the lack of a dedicated office space for the Grama Niladhari also posed difficulties to the residents in receiving regular government services. The CAP workshop also identified the need for a functional playground, as the youth and children in the area were unable to participate in outdoor sports or cultural activities due to the lack of playground facilities. “Shramadana” activities by community members. 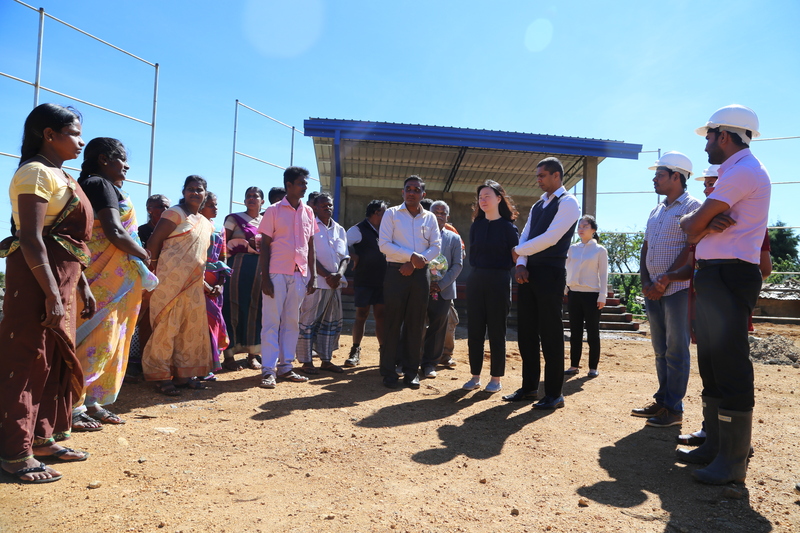 LKR.70,000, with LKR.30,000 for the MPCCC and LKR.40,000 for the playground, as well as their in-kind labour contributions for project activities. Once complete, the MPCC and playground will directly benefit over 5,000 people in Liddesdale estate and adjoining villages. The MPCC has multiple features and will be utilised for numerous purposes. The entire MPCC is 2,500 square feet, consisting of a large hall with a stage that will be used for cultural events, meetings, weddings and other important events. A separate room is reserved for the Medical Officer to conduct clinics and provide health services to the community. The building also has an office room, toilet facilities, a dressing room and an office room for the Grama Niladhari. Once complete, a number of shade and fruit bearing trees will be planted in the garden. 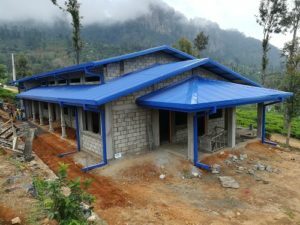 The MPCC is being constructed with fair face blocks for walls, Zinc Aluminium roofing sheets and window frames and wooden door frames. Disaster Risk Reduction features such as raised foundations, a braced structure with concrete columns, plinth beams, continuous lintel, roof beam and roof anchoring are being incorporated in the construction. The building design incorporates the standards of post-disaster building guidelines of Disaster Management Center, enabling its use as a temporary emergency shelter during a disaster situation. Several direct as well as indirect employment opportunities are being created in the area through the construction activities. It is expected that the technical and management capacity of the Liddesdale Estate Workers Housing Cooperative Society will also improve significantly by implementing this project. Visit by KOICA and UN-Habitat officials to the project site in November 2017. The HDI project is contributing towards human development through capacity building of youth, communities and local authorities; increasing resilience of the communities through settlement planning and community infrastructure; and through awareness creation towards mainstreaming plantation settlements. It is implemented in close collaboration with the Ministry of Hill Country New Villages, Infrastructure and Community Development. 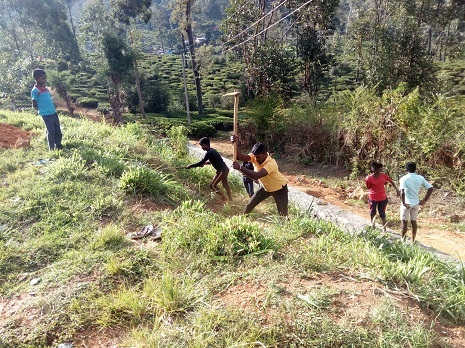 It is expected to benefit over 10,000 persons directly and 250,000 persons indirectly in Nuwara Eliya district. The project is being implemented from January to December 2017 in the Kothmale, Nuwara Eliya and Walapane Divisional Secretariat divisions.